First, find all the leaky spots in your home. This isn't hard, you will literally feel the cold coming through. The most likely is going to be around the windows and doors. They can also come from the baseboards, around the power outlets and random places in the walls. Depending on your level of handiness you can seal these leaks in a number of ways. There are kits sold in most stores, or there is caulk or even the hot glue gun. Squeeze some out where ever you feel the cold air seeping in. In the big box store, you will find kits in various sizes for covering your windows. Don't use these. Instead, buy a roll of exterior window plastic. This will be thicker and more insulating. Buy a roll of double stick tape and cover your windows. Baking adds heat two ways. One: the heat the oven puts off during and after baking. Two: your body heat will increase while you move around. Running a 2400 watt oven for an hour at 10 cents per kWh will cost 24 cents a day. Comparatively, running an 1800 watt electric furnace for an hour a day will cost $1.80. Don't use your oven to heat your home, this is unsafe. Use it to bake cookies - everyone loves cookies. Adjust your thermostat 7-10 degrees lower for 8 or more hours can save you 10-15% on your heating costs. Lower your thermostat whenever you aren't going to be home or while you're sleeping. 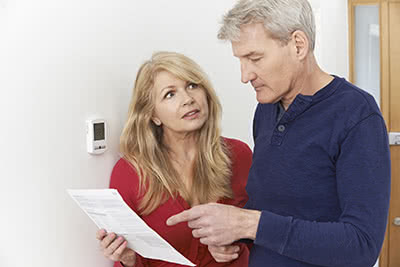 Don't change your thermostat up and down drastically in hopes to heat or cool your home faster. It just makes the furnace run for a longer amount of time to reach the desired temperature. Buy flannel or fleece sheets for your winter bedding. These will help hold in your body heat making you warmer while you sleep. If it doesn't seem warm enough add more blankets. Thicker fuzzier blankets will trap smaller pockets of air and they will heat up faster than larger pockets. On particularly cold nights you can use a heating blanket. These use about 15 cents of energy in 10 hours. Winter air is dry. Running your heater makes that dry air dryer. This lower humidity can lead to feeling dry and itchy, bloody noses and poor sleep. Ways you can increase the humidity would be to run a humidifier, air dry your clothes, add a few house plants, boiling water on the stove, or add a desktop fountain. Buy a hygrometer to monitor the humidity in your home's air. Try to keep this between 30 and 50%. Don't use your ventilation fans in either the kitchen or bathroom unless completely necessary. Turning these on means blowing your needed hot air right outside. Let that heat waft throughout your home. Hot air rises. Turn your ceiling fans on to push that hot air back down to where you can enjoy it. Using these tips will make heating your home more affordable in the winter. They are simple and effective ways of adding more comfort to your home. These tips can be used in your personal home or while you are renting. Using all of them together will give you the largest savings on your winter heating.